When the Museum Education Roundtable had our annual forum last week, featuring Keonna Hendrick and Marit Dewhurst speaking on “Dismantling Racism in Museums,” none of us knew that by this week, the events in Charlottesville and the fallout thereof would be bringing the discussion of racism, not to mention monuments, memorials, history, voice, and tolerance to the national stage. Hendrick and Dewhurst were recently guest editors of the issue of the Journal of Museum Education, “Identifying and Transforming Racism in Museum Education,” an issue with a number of compelling articles on museums ‘doing the work,’ listening, being better allies, and welcoming voices that have not always been represented. For museum workers interested in being allies and change makers, I highly recommend that issue’s reader guide, which goes along with the free access article. One of the ideas put forward by Hendrick and Dewhurst in their discussion was that of “brave spaces.” Safe spaces are good, but not enough for real change; to hear criticism, to offer experiences and personal details that make you vulnerable, to be able to move past an internal sense of “not this again” (as listener or as explainer), it takes bravery. To listen without immediately jumping to one’s own defense takes courage. To walk into a room and share your story with a lot of people who might or might not listen to you takes courage. “Listening can be a radical learning tool,” say Hendrick and Dewhust. 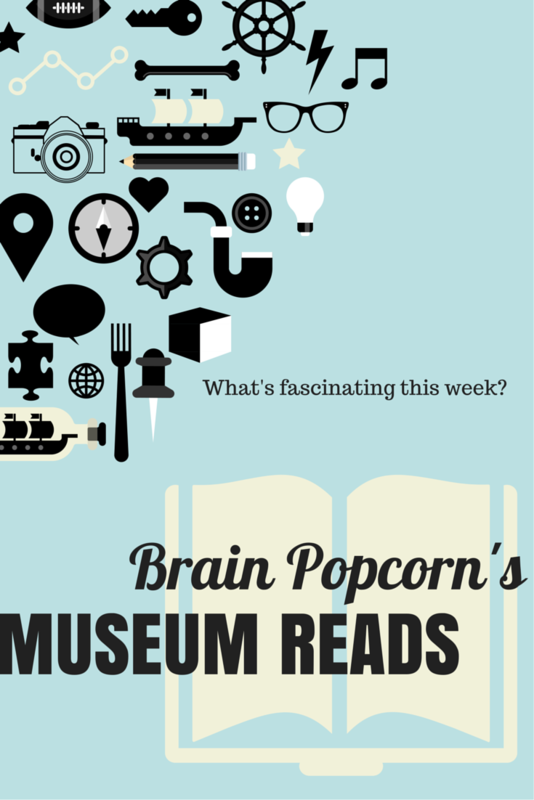 Museums aspire to be places of radical learning. We can be home to bravery, if we acknowledge that as mission-driven institutions, we are also therefore values-driven institutions. There was a lot of live-tweeting of the MER Forum; I recommend you check out the #MERForum2017 discussion on Twitter if you’re curious, and also keep an eye out for a possible MER blog following up on the forum in the next few weeks. “Polyvocality and Representation” A reflection on the Detroit Institute of Arts’ community engagement in exhibition development practices, featuring their Korean art installation and Art of Rebellion exhibit. Edited to add a few more great resource compilations! It’s almost Museums Advocacy Day, and soon I’ll be heading to DC for my second year of speaking up for museums, historical organizations, aquaria and zoos in the halls of Capitol Hill. It’s exciting to know that all 50 states have museum advocates representing them this year, for the first time ever, and that there are also about 100 more advocates coming to the event this year than last. We’ll be talking about the importance of the NEA, NEH, and IMLS, of course, but museums are energized about more than funding. We’ll be talking about education, STEM initiatives, conservation and research, diversity and equality initiatives, and museum contributions to health and human services. Other museums are also standing up in more political ways, taking a stand in opposition to the policies and statements currently coming from the White House, particularly those regarding immigration, education, and the environment. The Davis Museum at Wellesley College (Hillary Clinton’s alma mater) removed or shrouded all the objects in their museum which were made or donated by immigrants (and put their labels up for free download should other museums wish to do the same). The twitter account @MuseumsResist, with its companion for libraries @LibrariesResist, is offering up links and resources regularly for education and cultural sector professionals who want to be involved. It’s important to note that while there seems to be a groundswell right now, there are some museum professionals and museum organizations that have been participating in activism for a while, notably those associated with MuseumHue and #MuseumsRespondtoFerguson. Those folks deserve a lot of credit for leading the way and showing others in the field possible paths for discussion, response, and resistance. And when the DC Museums Advocacy Day is over, I’ll be far from done, as Maine, Connecticut, and Massachusetts all have advocacy days for museums, the arts and humanities coming up in March, so stay tuned! I’ve been having a lot of conversations with colleagues about history recently: appreciating it, analyzing it, reinterpreting it for a new generation, and collecting it for future generations. Clearly, I’m not the only one having these conversations, especially as we are in the middle of a lot of newsworthy current events. Last week was #MuseumsAdvocacy2016, hosted by the American Alliance of Museums down in DC. It was several days of training, talking about museum issues, sharing big ideas, meeting up with old friends and making new ones, and talking to legislators and their staffers about everything from STEM education to charitable giving tax deductions. It was about 250 people participating in the ardent practice of democracy, and it was awesome. Media literacy has been a long-held interest of mine: an essay I wrote about it was part of the web resources for PEM’s Eye Spy: Playing With Perception exhibit, and elements of those same visual/critical thinking skills ideas also worked themselves into the teacher guide I wrote for middle and high-school based on the same exhibit. In an election year like this one is shaping up to be, where paying attention to the kinds of language candidates use gives you a lot of information about who they are and what they’re trying to do with their platforms, it’s important for educators in both classrooms and museums to step up their game around teaching those critical skills. Otherwise, who’s to notice when one candidate gets an overwhelming amount of media attention for no critically apparent reason? I spent all weekend marinating in poetry at the Massachusetts Poetry Festival, which was incredible and thought-provoking as always. As an interdisciplinary enthusiast, I was enthralled with the ways I saw people talking about poetry and science, poetry and art, poetry and environmentalism, poetry and current events, poetry and civil activism. Coming back to my museum-persona, I was glad to see some of those same kinds of discussions are happening in this field as well, at AAM last week and continuing online and abroad. 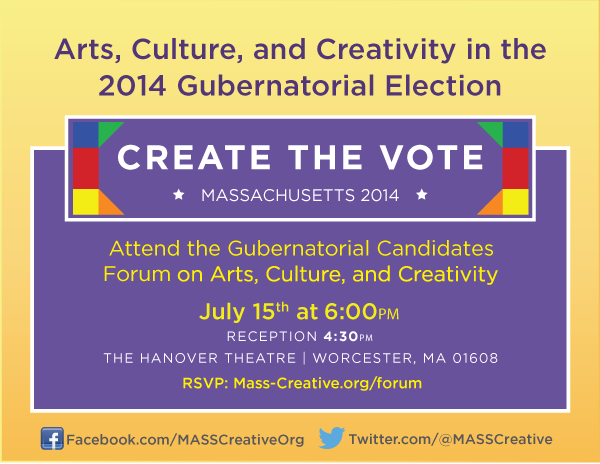 On Tuesday, the non-partisan advocacy group, MassCreative hosted a forum in Worcester where all the gubernatorial candidates were invited to attend and talk to arts leaders and advocates about their platforms for supporting the arts in Massachusetts. Most attended, though Republican Charlie Baker neither bothered to show up in person nor send a representative. About 600 arts leaders, participants, and activists were in the audience, and they were both enthusiastic and determined to get some nitty-gritty answers to their questions about arts funding and state support. MassCreative put together a summary of much of the tweeting that went on at the event here, and I also tweeted a number of the moments that caught my ear (find the whole set @mwinikates). You can also find much of the same material from the evening covered in the candidates’ position surveys here. I agree, and I hope that MassCreative keeps up the good work in the time between now and the election (and after!). Looking for more? There’s another great round-up of the evening’s event over at Dig Boston. Are you invested in the future of culture and the arts? Do you have friends or family members who are? Do you plan to vote in the next Massachusetts race for governor? If you answered yes to any of the above questions, and can get to Worcester (or one of the bus departure points) on July 15th, please consider signing up here, and I will look forward to seeing you there! If you can’t make it, and want me to ask a question at the forum, please let me know in the comments below, and I will make a full report after.